GREATER POTTSTOWN TENNIS & LEARNING – Inspiring lives on and off the court. Get a great workout and meet new players! SPRING Clinic Session registration is OPEN! Professional coaches run fun game-based group tennis instruction for all levels of adults age 18 and up. Learn fundamentals, proper techniques and singles and doubles strategies. 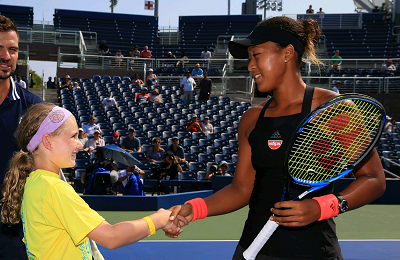 Brenna, a GPTL junior player, participated in the ceremonial coin toss for Naomi Osaka’s round one match at the Net Generation “Kids on Court” Demonstration at the 2018 US Open. Naomi Osaka went on the win the women’s singles championship.